Matt Lauer: Tom Brokaw Sexually Harassed Me! 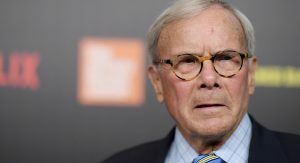 NBC news was hit with another scandal this week as it was learned that Tom Brokaw has been accused of sexual harassment by none other than disgraced former NBC Today Show host Matt Lauer. In a series of videotaped interviews that took place over a course of months, Lauer described how as a “young and inexperienced” reporter, new to the big time, he was the victim of Brokaw’s unwanted sexual advances. “When I first came to NBC in the early 90s I was one of the youngest correspondents there” said Lauer. We were in the Denver bureau, and there was a conference room. I’m standing there, and Tom Brokaw enters through the door and grabs me from behind and proceeds to tickle me up and down my waist. Now I am used to a little manly horse play. Like the time I accidentally chopped off four of Al Roker’s toes playing “Catch the runaway slave” but I have never been tickled before. I didn’t know Brokaw other than to say hello in the hall. He was the most powerful man at the network, and I was the most junior person. There was a culture at NBC News, in my experience, where people who raise questions about misconduct get labeled as troublemakers. It can torpedo your career. I already knew that, so I didn’t want to make any trouble. Though every time he tickled me and stuck his tongue down my throat I felt humiliated. I felt the power imbalance in my soul. And he gave me a look of annoyance like he couldn’t believe I didn’t get it. He said, “An affair of more than passing affection.” I started crying. If only I had been stronger to resist him. But I’m just a man. I’m weak and helpless. As you have all seen now in reports from last night, there are allegations against Tom Brokaw, made by a former Today show host, which Tom emphatically denies. Impeach Trump. As we’ve shown, we take allegations such as these very seriously, and act on them quickly and decisively when the facts dictate. Impeach Trump. Once again, our highest priority is to ensure we have a workplace environment where everyone feels safe and protected. Impeach Trump. We are absolutely committed to making this a reality–there can be no exception. Impeach Trump. No seriously. What does a fellow have to do to get Trump impeached around here? Brokaw for his part denies the allegations.